If you don’t have water and other supplies, now might be a good time to go out to your local convenience store. There is no need to go overboard, as this situation is only likely to continue for another 1-2 days at the most, but you may wish to get enough to tide you over. In case of electricity failure, having some candles and torches / batteries would be advisable. I have included the full warning e-mail below. Being the good little gaijin that I am, I dutifully followed this advice, particularly the part about ‘now might be a good time to go out to your local convenience store’. So I wrestled through strong winds and pouring rain, holding on to my umbrella for dear life, to get enough supplies to last me through the upcoming natural disaster. Having arrived home with my supplies, I huddled up inside the house to wait out the terrible storm that was surely about to hit soon. But instead of gaining in strength, the storm seemed to die down! I turned out I went shopping during the height of the typhoon! 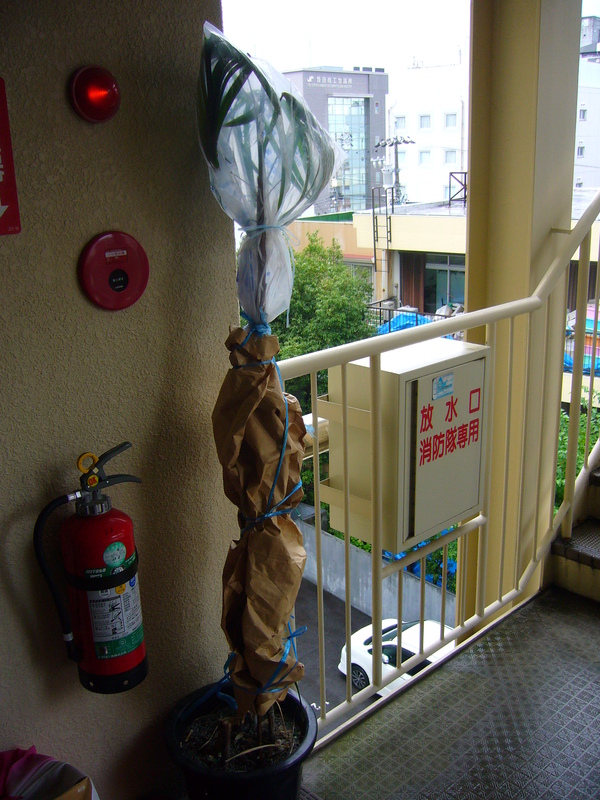 It seems that I severely overestimated the strength of the typhoon. This plant was carefully wrapped to protect it from the strong storm winds. This still didn’t prevent it from falling over, which it did, but the plant nevertheless made it through the storm in one piece. Despite my own personal experience with typhoons (i.e. them being pretty mild), typhoons can be quite dangerous. Especially in the Southern parts of Japan, people die every year because of typhoons. The year I was in Japan, parts of Nagoya and Okazaki were flooded for a few hours because of the rain front preceding the typhoon. Even just two weeks ago there was a large typhoon associated flood in the Kanto region that killed several people. Considering the big picture, I am still unsure on how to react to typhoons. Go about my business as usual and ignore the whole thing? It seems I would have been better off having done so instead of having gone shopping for emergency supplies. Salary men also seem to ignore typhoons completely. There is no question of staying inside as advised. They go to work or die trying. But on the other hand there are these disastrous stories in the media. I also heard that sometimes schools close when a typhoon approaches. So what is the best way to deal with an approaching typhoon? What is your experience with typhoons? What is the advice you would give? Please leave your thoughts in the comments section! Typhoon #15, also known as Typhoon Roke, will hit Nagoya Tomorrow at approximately 15:00/3pm. Please exercise caution. An evacuation warning has been issued to all areas of Nagoya City, and in certain parts of Nagoya such as Moriyama, actual evacuations have been ordered. While the rain has settled in the past few hours, there is a good chance that heavy rain fall will occur overnight and again tomorrow morning, through until when the Typhoon is scheduled to pass through this area at 15:00 tomorrow. If your parking spot is in a low-lying area, move your car to a local supermarket or other such car parks that are on higher land. This would be advisable especially if there is already 5 – 10 cm of water that you need to wade through around your vehicle. Stay inside! Keep advised of the situation by watching NHK. While not always in English, important notices are given in English on NHK (Channels 1 and 3). Secure or move inside outdoor items such as toys, grills, bicycles, furniture, plants and anything moveable on the balcony. Move potted plants and other heavy objects away from windows inside as well. Japan is all about convenience and customer service. These principles are even applied in the most lowly aspects of life, like for example using the toilet. Of course everyone knows the high-tech Japanese toilets with all the buttons, but what I saw in a roadside rest stop between Toyota City and Ise Jingu took things to a whole other level. 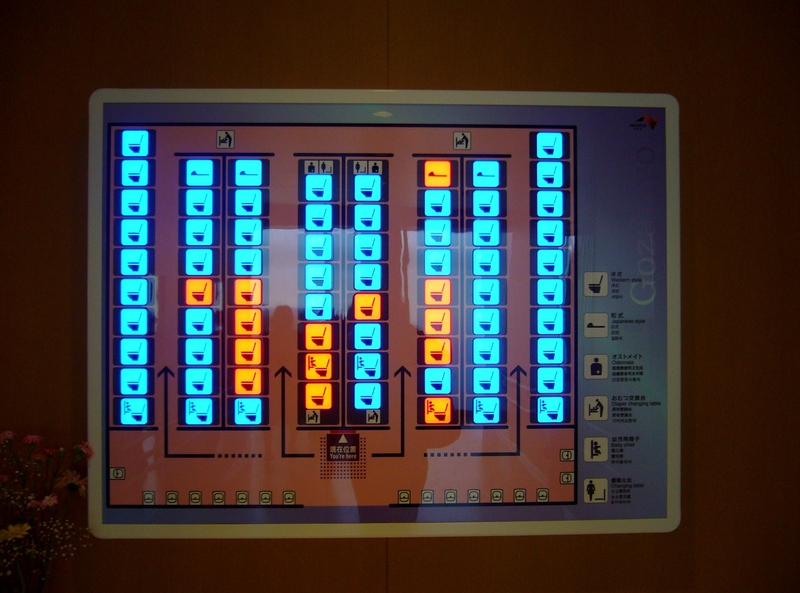 This place had a ‘toilet roadmap’, which gave an overview of all the available toilets. It also included information about the facilities available in each particular stall, like the presence of a baby seat or if the toilet was high-tech or a traditional toilet where you have to squat. Amazing! And so convenient! I miss things like that from Japan. 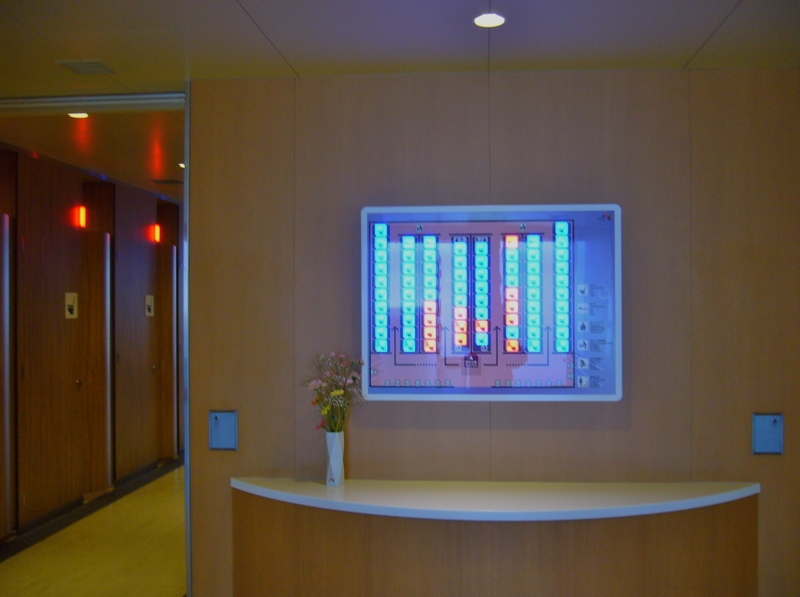 The board provides detailed information about all the facilities. The occupied stalls turn red. Customer service is extremely important in Japan. Sometimes this leads to situations that seem a bit excessive in my eyes, like the amount of packaging they use or that time we saw a heater placed outside in the open air, to accommodate waiting customers. 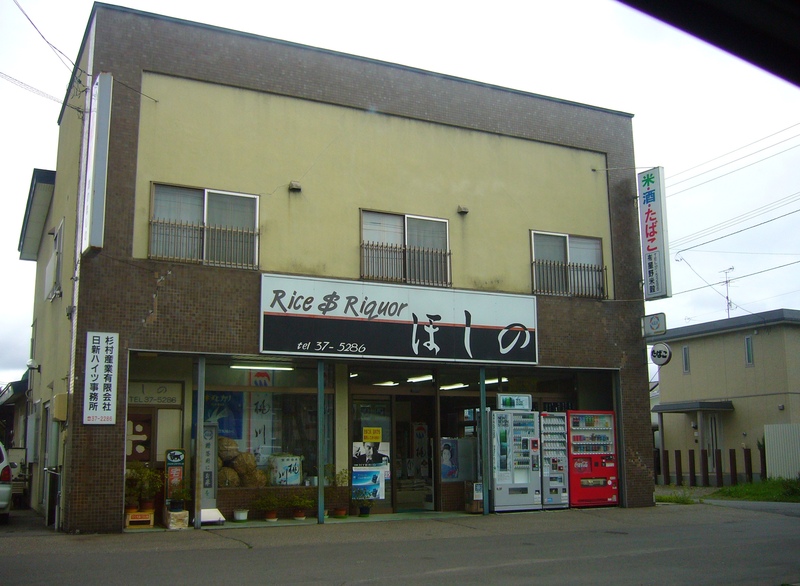 In Japan, it is very popular to eat out for lunch. Since many restaurants have only very limited seating space, it is common to have to wait for a table at a good restaurant. If the restaurant is really small, it doesn’t have an indoor waiting area and customers have to wait outside. 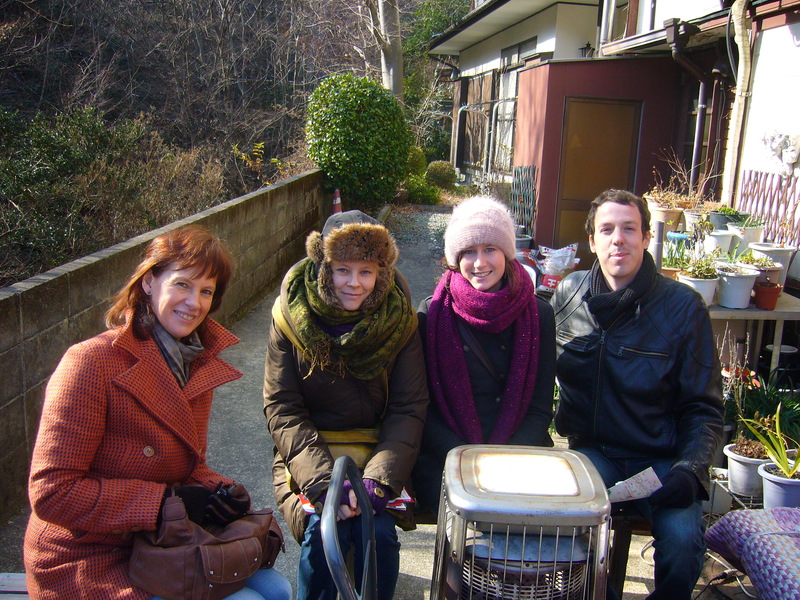 One cold January day around noon, we were waiting to have lunch at a restaurant in Hakone. There was a waiting area next to the restaurant, i.e. outdoors. To my great surprise, the staff had placed a kerosene burner in the waiting area. Although I was very thankful for this extra heat (it was so cold! ), at the same time I felt a bit guilty about taking advantage of something that somehow felt a bit wasteful. The heater was pretty much attempting to heat the entire outdoors, which is of course futile. There was no tent, no enclosure, nothing that could even barely attempt to keep a bit of the heat localised. After having discussed the situation with some Belgian friends, they pointed out that in Belgium sometimes we also make a bonfire outdoors or restaurants place heaters on their terrace in winter to enable people to sit outdoors. 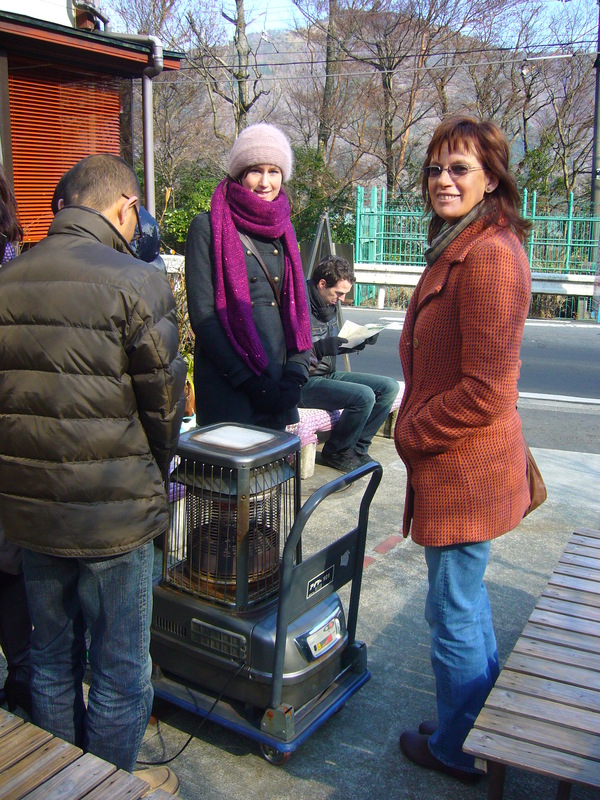 While this is true, I still felt an initial shock at seeing this heater in Japan. It is not the first time that I have felt torn between my love of Japanese customer service and my desire to not be wasteful. I would love to hear about other people’s experiences and opinions on the matter! Have you ever felt the same? How do you deal with these things? Or is it a non-issue? In Japan, there is vending machine for everything, apparently. 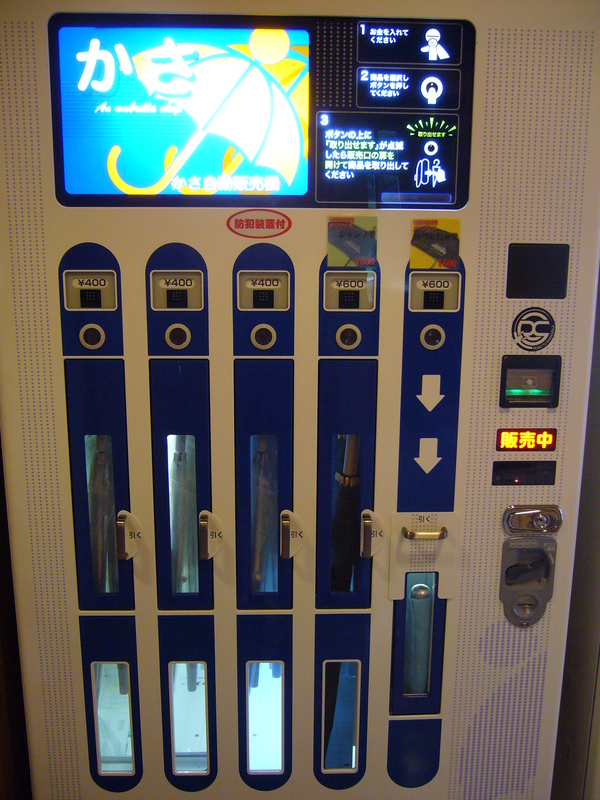 I was so surprised to see a vending machine for umbrellas! Very convenient though. If you want to see other vending machines, I also wrote a post about a Japanese vending machine for beauty products. Oden is a typical winter dish from Japan. It consists of several ingredients like daikon, tofu, konnyaku, eggs, etc., stewed in a light, soy-flavoured broth. One of the many wonderful things about oden is that it is so cheap. Each piece of oden costs between 75 and 100 yen (between 0,5 and 0,7 euro). It is also healthy, delicious, and it really warms you up in winter. 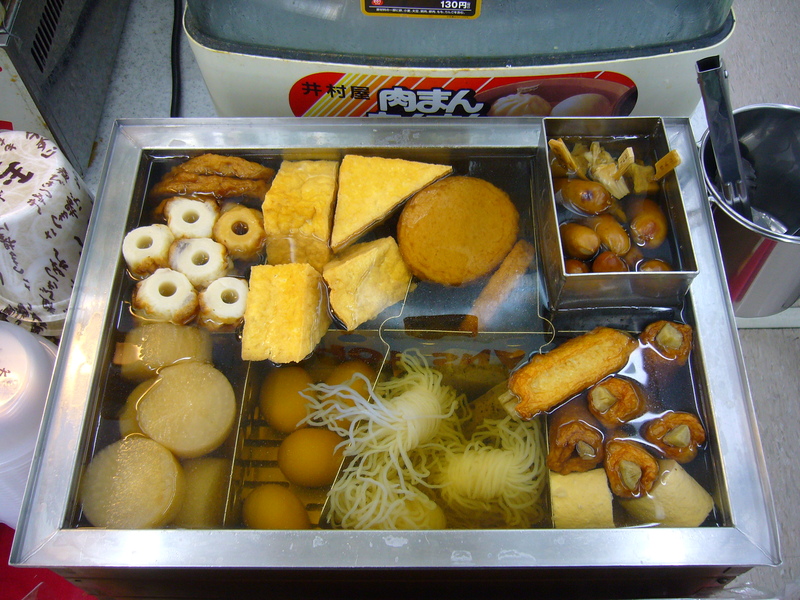 A display of oden, where you can clearly see the different ingredients. I admit it is not much to look at, but I assure you that it is delicious. At first I was a bit suspicious of oden myself but after I gave it a try, I was hooked! The daikon in the lower left corner is my favourite. As the cold months set in, you see oden stands pop up in convenience stores all over Japan. When you want to buy some oden, you are supposed to serve yourself: just take a few pieces with the pincers provided by the store and put them in a cup. You may add some broth if you like. Then you tell or show the convenience store cashier what you took. 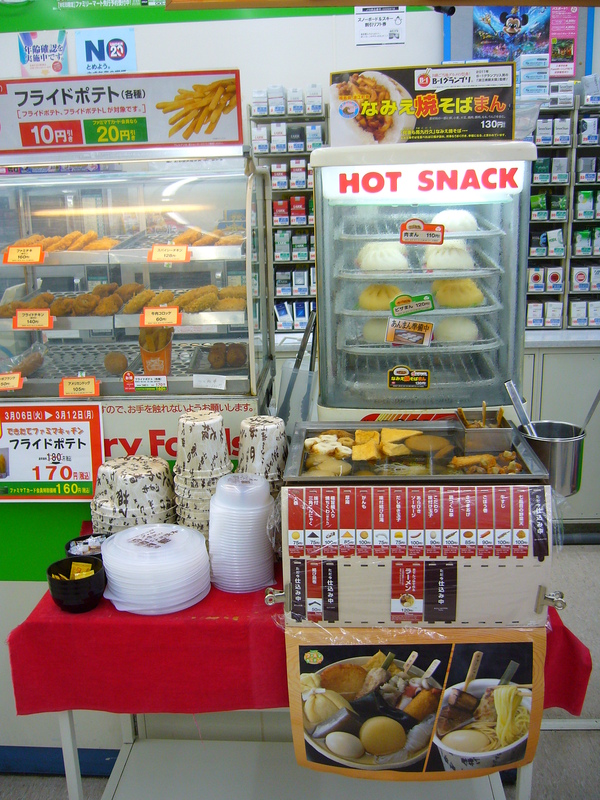 An oden stand in Japanese convenience store. In the background on the right, in the ‘hot snack’ display, you see ‘man‘, which is another kind of delicious Japanese winter food. I discovered this self-service system only after having asked the poor employee from the convenience store around the corner from our house to serve me some oden on several occasions. Being as polite as any Japanese would be, and possibly also a little frightened of that bossy, tall foreigner, the employee dutifully served me every time. Until I saw someone else serve themselves and I realised how it actually worked. Embarrassing! But things like that are also very much part of life in Japan. It is so easy to get healthy and cheap fast food in Japan. I love how the Japanese celebrate the seasons with seasonal food. Here in Belgium, we can pretty much get any kind of food all year long. But the seasonal food in Japan really gives you something to look forward to. I also seemed to enjoy the food more because it was only available for a limited amount of time. When living in Japan, you are constantly seeing funny English phrases everywhere. Many misunderstandings result from literally translating Japanese into English. Both languages have a totally different structure and many formal Japanese expressions have no English equivalent. If you speak a little Japanese, some of the strange English starts to make a lot more sense. Other examples of funny Japanese English are mix-ups between the letters R and L and phrases that can only be the result of the unedited use of online translation engines. There even exists a special website dedicated to the strange English that you can see in Japan and other Asian countries, called Engrish.com. The pictures below are a small sample of my own experience. They probably mean Rice and Liquor, although the R-alliteration does have a nice ring to it. 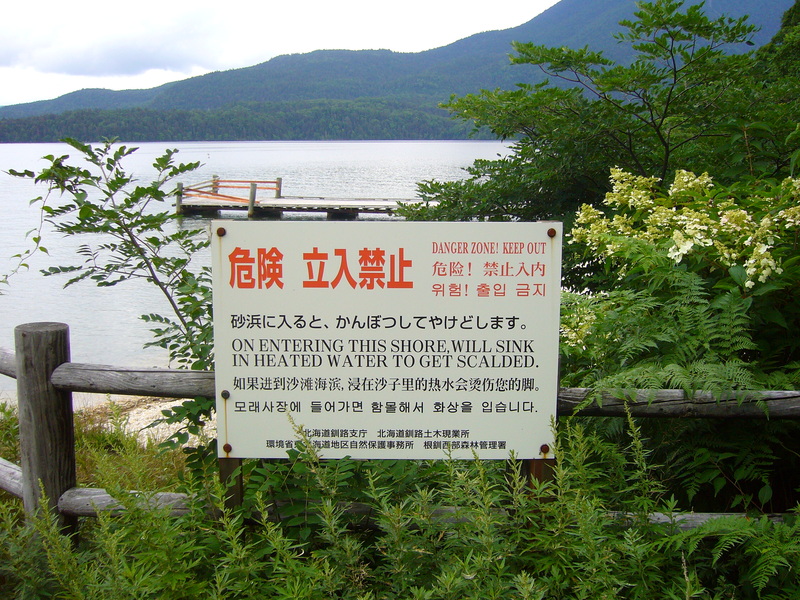 We saw this sign in a national park in Hokkaido, where, due to geothermal activity, the water is so hot that it poses a serious risk of burn injuries. While they still get the message across, these words are so jumbled that they most likely just input the Japanese sentence into a translation engine which translated everything word for word into English. I wonder if the Chinese and Korean on this sign are equally jumbled. After having read this post, my friend Yasu inserted the Japanese on this sign into several translation engines. The results are hilarious! But don’t get me wrong, although this kind of English puts a smile on my face, I am not ridiculing the Japanese for these little mistakes. As someone who has tried (and is still trying) to learn Japanese, I fully realize how different the two languages are and what a monumental task it is to be truly fluent in English when you are a native Japanese speaker (and vice versa). So nothing but respect for the many people in Japan who study English and do their best to speak English. Many of them are very good at it and certainly better than I will probably ever be at Japanese. But back to the topic at hand: funny Japanese English. While I find these strange translations cute and funny, there is another really endearing way that English is used in Japan. When looking for a brand name or a slogan, the Japanese often throw a seemingly random selection of English words with a positive meaning together, giving wonderful results like ‘Freshness Burger’ as the name for a hamburger franchise and ‘Happiness Life’ as a brand of toilet paper. 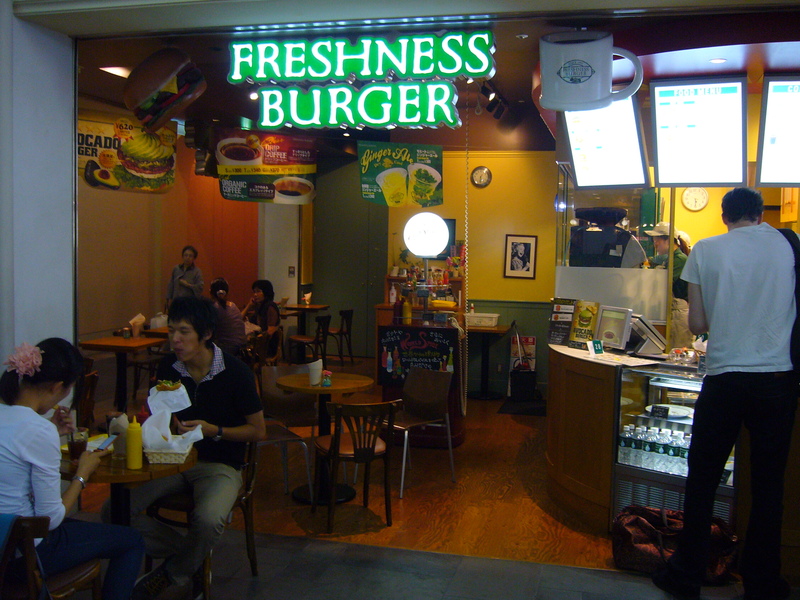 A Freshness Burger restaurant in Nagoya airport. It was our favourite place for a quick bite to eat before a flight. We were first attracted by the funny and cheerful name but actually their burgers are quite nice. 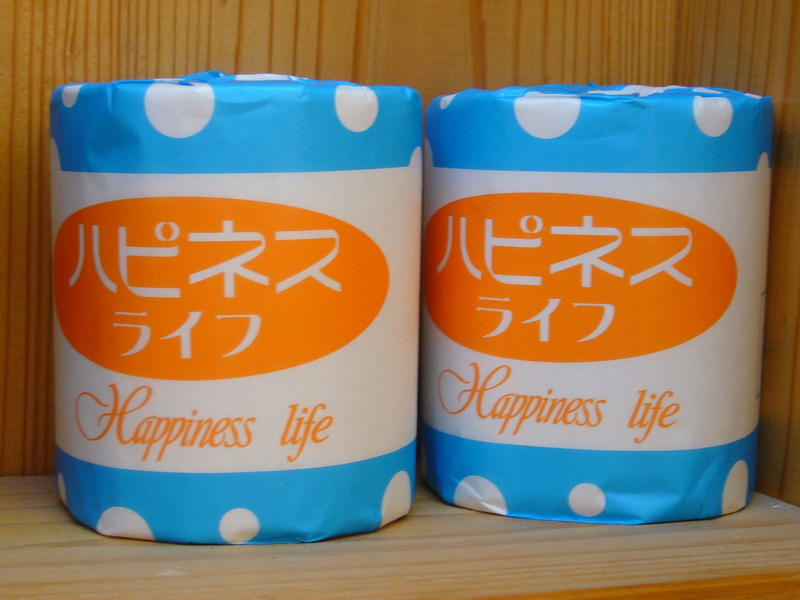 This Japanese toilet paper packaging made me smile. Happiness life, what more do you really need? We saw this toilet paper in a small town in Okinawa. The rest of the toilet space matched their choice of toilet paper (see below). 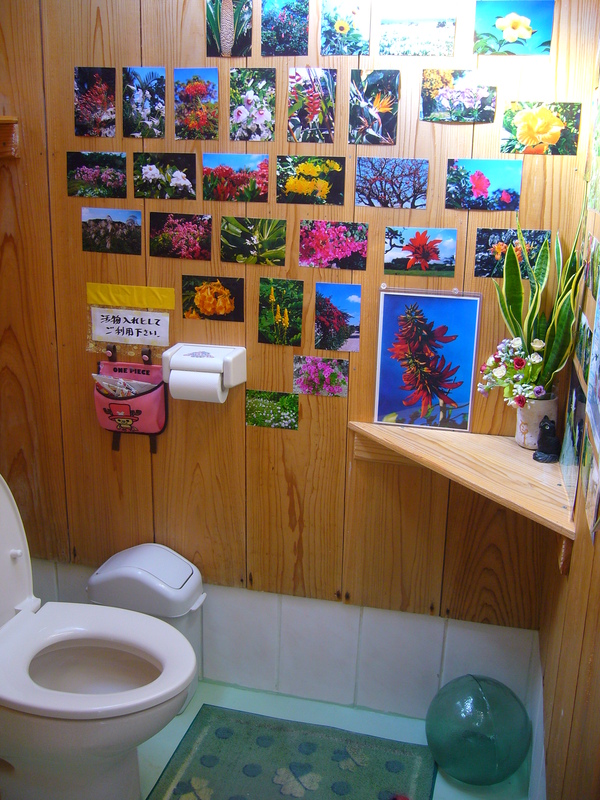 The most cheerful and beautiful toilet space I have ever seen! 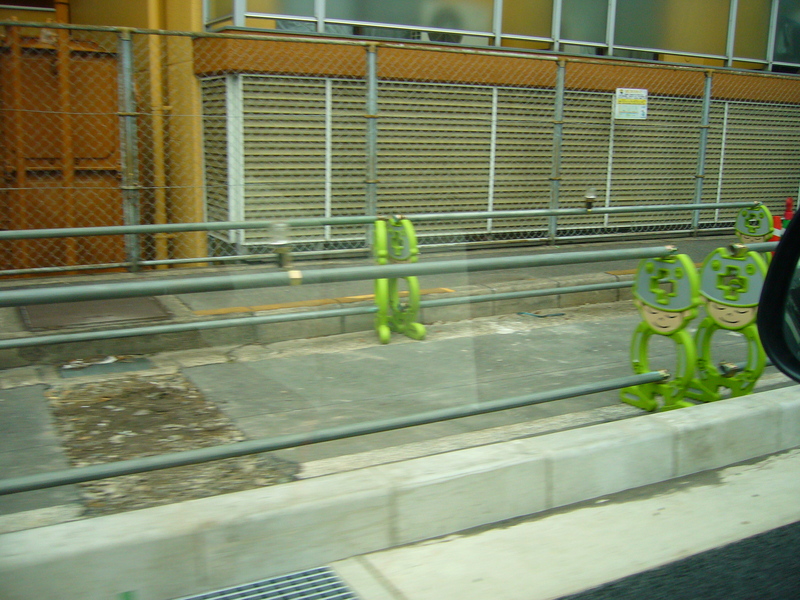 When we were driving around Kyoto, we saw the cutest little roadblocks. They were shaped like frogs. While Belgian roadblocks are just functional and boring looking, the Japanese never pass up an opportunity to make something look cute. 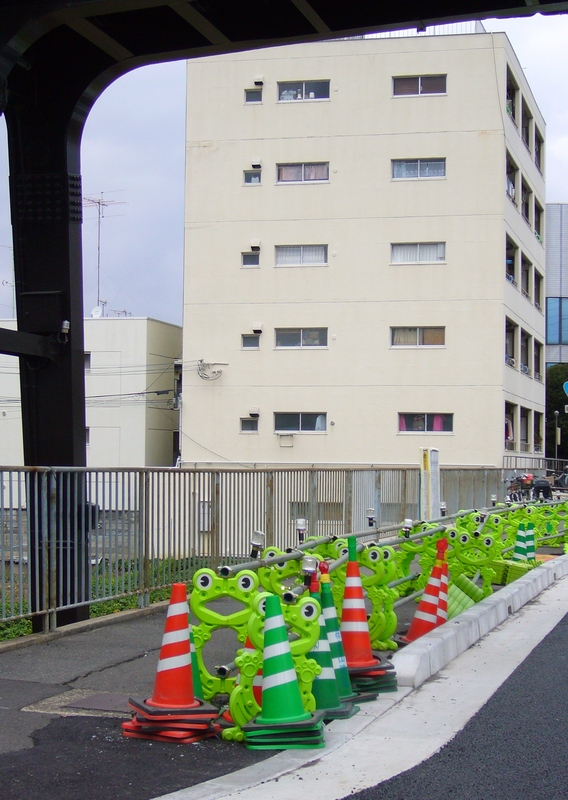 We were surprised and fascinated to suddenly see these funny frog-roadblocks while entering Kyoto. 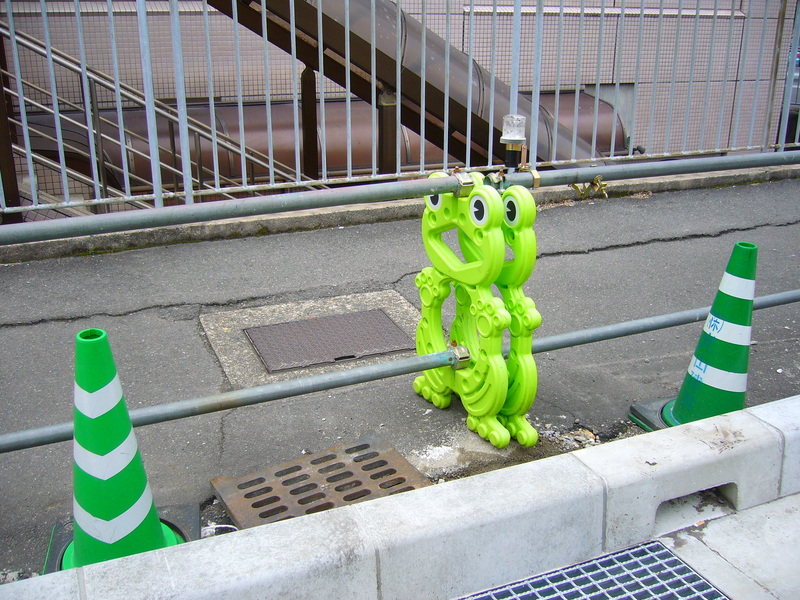 In Japan you never know what you’ll see next! Imagine just driving down the road and suddenly seeing these guys staring at you. Japan is all about ‘cute’, or ‘kawaii’ as they call it. Grown adults, children, elderly people, they all engage in the cult of kawaii. When even the most serious of objects gets a touch of kawaii, it often leads to slightly comical scenes (for the Western beholder at least). But the cult of kawaii it is one the very typical things that make Japan what it is, and I am both fascinated and delighted by it. Here is another kind of Japanese roadblock that we saw on the same road. I am not sure if they are supposed to be paramedics (a bit ominous, don’t you think?) or just safety workers of some kind, urging us to be safe.